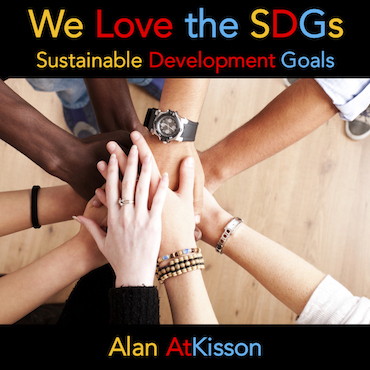 The AtKisson Group has been deeply involved in supporting the SDGs since 2012. We have been involved in their formation, development, launch, communication, and now their implementation. We believe in the UN’s 2030 Agenda and the Sustainable Development Goals (SDGs) as a process of global transformation, and we have done everything in our power to help achieve them as well. But recently, we realized that the full extent of our commitment to the SDGs, and all the actions we have taken to support them, might not be very visible. So here is a quick review of what we’ve done — and what we are still doing. During the period when the SDGs were being framed and negotiated, AtKisson Group was sponsoring a global program that helped people participate and engage with the process. Our Pyramid 2030 campaign made a free, simplified version of our popular Pyramid workshop available to everyone for the first time. 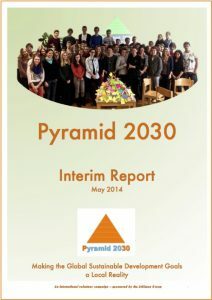 “Pyramid Lite” is now at the core of our AcceleratorLite toolset, but it was first created especially for this campaign — and for a shorter school-based campaign that preceded it, called Pyramid 2012, which coincided with the Rio+20 summit, which in turn launched the idea of the SDGs. Between 2012 and 2015, hundreds of groups around the world ran Pyramid workshops, and many submitted the results of their workshop to us. We turned those results into reports, which were then submitted to the United Nations as part of the process of civil society engagement in the framing of the Sustainable Development Goals. All of this work to make the SDG process more visible, and to help create a sense of participation in the process, was performed by AtKisson Group at our own initiative, pro bono, with the help of many volunteers. When it was time to tell the world about the SDGs, AtKisson Group stepped forward with an idea: the 17Goals partnership. We recruited over 20 other organizations from countries around the world to work with us. Then we launched a website and social media campaign designed to support the global communications effort to make people aware of the SDGs. The resources at the 17Goals educational website include a free, high-quality PowerPoint slide show that has been downloaded hundreds of times and used in countless presentations to schools, government officials, business leaders, designers, you-name-it. We even heard that some government officials were using our slides as part of their official work to present the SDGs to new audiences. We also produced a song and music video, We Love the SDGs. The video has been viewed over 26,000 times and has been used by the UN itself in official international meetings, to provide a little inspiration to the delegates. A study guide to the lyrics turns the song into a teaching aid. 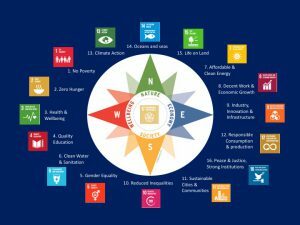 A choral arrangement (created by a student choral group at Arizona State University) is freely available for download … so that everyone can sing “We Love the SDGs”. The production of all these resources was sponsored and paid for by the AtKisson Group. When the world’s nations convened for the UN’s first-ever high-level conference on the oceans, in June 2017, AtKisson Group covered the action with a website and social media channel created specially for the occasion. We helped people understand the basics of SDG 14, the “Ocean Goal,” which was the focus of the conference. And we provided a stream of news on what was happening to advance progress on that goal, as well as to help people understand its links to other goals. And we got noticed: even the president of the UN General Assembly was re-tweeting our social media postings. At the same time, at our home base in Stockholm, Sweden, we were sponsoring a dramatic and inspiring exhibition on the reality of ocean plastic pollution, called OUT TO SEA. 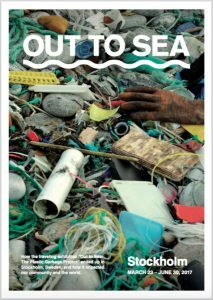 Working with other friends and partners here, we also managed a global crowdfunding campaign to help finance this traveling exhibit (created by the Museum for Design in Zurich) and to spread the word of the problem of ocean plastics, globally. That work also got noticed: over 30,000 people came to see the exhibit, and one of the popular morning news shows in Sweden did a live broadcast that included a video tour of the OUT TO SEA exhibit. AtKisson Group paid all the costs for SDG14.net as a pro bono activity, and we were a major financial sponsor for OUT TO SEA. We also managed the project and hosted its administration — again, entirely pro bono. 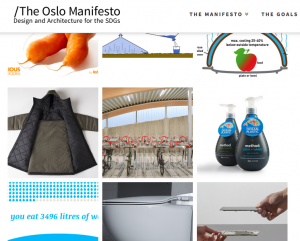 Working through the 17Goals partnership, we have also provided extensive support to the Oslo Manifesto initiative — a groundbreaking effort to translate the SDGs into “design language,” and to inspire designers and architects around the world to adopt the SDGs as the “ultimate design brief.” Our partner in this work, and the lead financial sponsor of the initiative, is the Norwegian government’s Center for Design and Architecture (DogA). 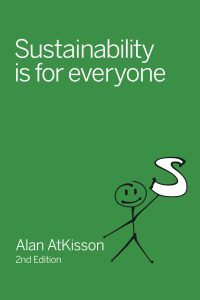 To be transparent, we have also earned a bit of revenue: Alan AtKisson has been paid to provide keynotes on the SDGs to a number of design conferences, linked to the Oslo Manifesto. But AtKisson Group has also donated many hours of time to support this joint DogA/17Goals initiative. Our commitment to the SDGs has obviously gone far beyond a mere professional commitment — but of course, the SDGs are also at the core of our consulting work these days. They are fully integrated into our Accelerator Tools. We advise companies on how they can incorporate the SDGs into their sustainability work. We help governments develop SDG-related strategies. And we support the United Nations itself, in its own work to implement the SDGs and to support the nations of the world to achieve this bold vision. As a world, we have 13 years left to realize this vision of a better way of life, for everyone, on our precious and irreplaceable planet. AtKisson Group has been dedicated to that vision for a long time, since long before it had the name “Sustainable Development Goals.” And we intend to keep working on it for a long time to come, professionally and personally — paid and pro bono. That’s what the word “commitment” is all about.